Computer Organization and Architecture is a comprehensive coverage of the entire field of computer design updated with the most recent research and innovations in computer structure and function. With clear, concise, and easy-to-read material, the Tenth Edition is a user-friendly source for people studying computers. Subjects such as I/O functions and structures, RISC, and parallel processors are explored integratively throughout, with real world examples enhancing the text for reader interest. 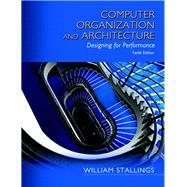 With brand new material and strengthened pedagogy, this text engages readers in the world of computer organization and architecture.